ASL sign "A" - make a fist with your hand but your thumb is pointing up, beside your index finger. 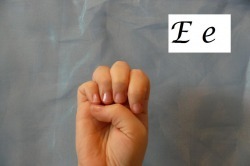 ASL sign "E" - make a fist, but then tighten your fingers upwards, your thumb rests under the tight fingers. ASL sign "G" - Your index finger points sideways and your thumb rests on top of you middle finger also pointing sideways. 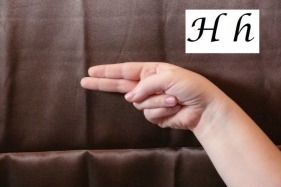 ASL sign "I" - make a fist but point your pinky finger straight up. 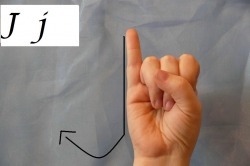 ASL sign "J" - With your I finger, draw a letter "J" in the air. Videos will often have a scroll over box pop up, near the bottom of the window. The word will be written there that you are looking at in sign.